Dishwasher And Garbage Disposal Are Both Not Working – What To Check? My garbage disposal and my dishwasher do not turn ON. This happened at the same exact time and all of a sudden. I went to turn the garbage disposer on with the wall switch and it does not turn ON. I also tried to run the dishwasher a little later and it will not turn on either. I have checked under the sink and they are both plugged into the electrical outlet. I do not know anything about electricity. What am I missing? Dishwasher and Garbage Disposal NOT WORKING – What To Check?? If both the garbage disposer and the dishwasher stopped working at the same time, then it is a simple electrical outlet issue. In 90% of homes or apartments the dishwasher and the garbage disposal are BOTH plugged into the same electrical outlet UNDER THE SINK. This electrical outlet located under the sink is called a GFCI outlet (ground-fault circuit interrupter). These electrical outlets have a safety circuit built into them. At times, the GFCI outlet will trip or reset and NEED TO BE RESET MANUALLY. When a GFCI outlet trips, it will not supply power. It basically turns off and does not allow any electricity to flow from it. When this happens, it needs to be reset to “turn it back on”. Go under the sink and locate the electrical outlet that your dishwasher and garbage disposal are plugged into. Unplug both the dishwasher and garbage disposal from the GFCI electrical outlet. 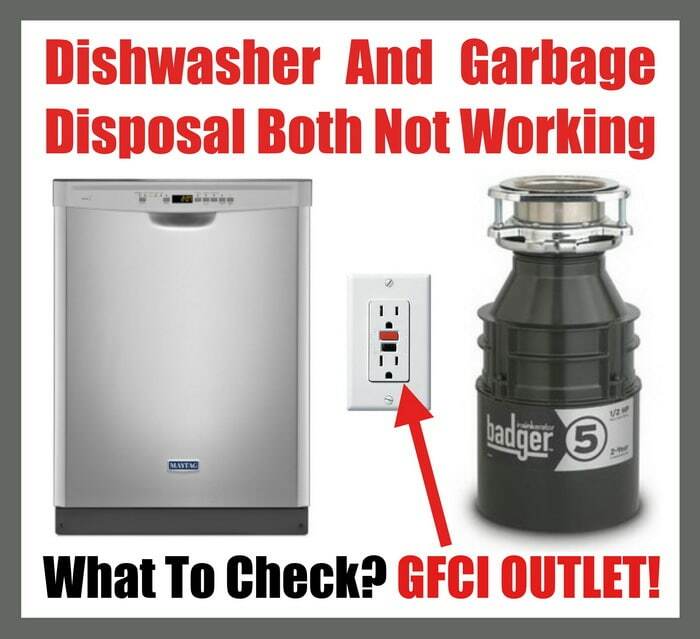 Plug the dishwasher and the garbage disposal back into the GFCI outlet. Test run the garbage disposal and test run the dishwasher. If they both turn ON, your problem is fixed. If after resetting the GFCI outlet the dishwasher and the garbage disposal do not turn ON, check the breaker box in your home or apartment to see if the circuit breaker for the KITCHEN OUTLETS has tripped. If so, reset it and your problem is solved. Need help figuring out why your dishwasher and your garbage disposal have BOTH stopped working? Please leave your question below and we will be more than happy to assist. Food grinder just humms and dishwasher won’t run right. Grinder still does not work with drain disconnected (not plugged). Does disposal have to operate for dishwasher to function? Dishwasher does drain through disposal. My dishwasher and disposal are plugged into an outlet under my sink but it does not have a reset button. I have pushed every reset button in my kitchen but they still do not turn on. We just switched to solar power when this problem occurred. I do not have a gifi under the sink i have one next to the switch for the garbage disposal and it is on. both the disposal and the dishwasher are plugged in to the same wall plug outlet. Next post: New HE Washing Machine Is Very Loud On Spin Cycle – What Can Cause This?